How can we make smart robots as popular and widely used as smartphones? Ploppin’ ‘em in your pocket is a good place to start—or your cupholder, in this case. At the Tokyo Motor Show this week, a miniature version of the first talking robot in space was revealed. It can hitch a ride in your car with you, keeping you company while driving—and maybe keeping you safe, too. Meet Kirobo Mini. He’s not even four inches tall. He’ll talk and gesture and respond to your emotions—a common trait in Japanese robots nowadays, like Pepper, who we’ve reported at length. And Toyota’s hoping that Kirobo Mini will keep you safe, perhaps by keeping you from daydreaming and driving off the side of the road. It’ll say stuff like “Oops!” if you slam on the brakes, or start talking if it senses a dip in the conversation. 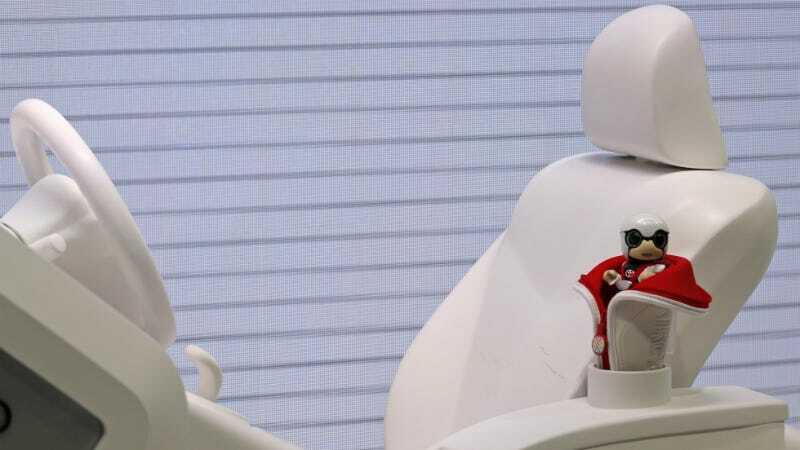 Basically, from Pepper to Sony’s robotic companion dog Aibo, many of Japan’s robots aim to build relationships with humans. Kirobo Mini seems no different. Sound like the ‘bot might be kind of annoying? Maybe. But it’s far from any point of commercialization. It’s a concept design at this point, and is only programmed to speak Japanese. But down the road, Kirobo Mini could interact with apps and have greater functionality with smart cars, in addition to basic features like GPS navigation. On their website, Toyota says that the pipsqueak machine could be integrated into its vehicles to gather hours of driving data that suggest places for you to visit based on your mood and driving history, music to listen to, and other features that use big data. We previously covered Tomotaka Takahashi, the famous Japanese robot maker who’s broken Guinness records with his cute, approachable robots—like when he partnered with Toyota to send Kirobo to the International Space Station. Kirobo was a humanoid robot that had the first conversation in space with a human. He designed Kirobo, and his little brother, too. Last month, we covered Takahashi’s big collaboration with Sharp: Another pocket-sized robot that acts as a smartphone, movie projector, personal secretary, and more. These innovations might seem goofy or impractical, but some of Asia’s biggest tech giants are banking on personal robots taking off in the near future. Kirobo Mini is the most recent ‘bot of likely many more to come.